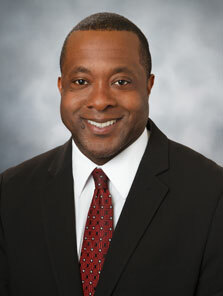 David J. Clark is senior vice president of Operations for Broward Health. David is an experienced healthcare operations manager with extensive experience in successfully managing portfolios, programs, corporate non-clinical service departments and projects in both the public and private sector. Prior to Broward Health, Mr. Clark worked as the associate vice president, facilities construction and design at Jackson Health System. In this role, he oversaw all project initiatives throughout the system, and directed design and construction of all expansions, new construction, interior and exterior renovations and infrastructure expansion and replacement projects. He has over 18 years of professional healthcare experience in the design and construction industry in both the public and private sector. He is currently a member of the American College of Healthcare Executives and Kappa Alpha Psi Fraternity. He is a licensed certified general contractor, a LEED accredited professional and a real estate associate. Mr. Clark earned his undergraduate degree in architectural and facilities engineering from Tennessee State University in Nashville, TN, and his Masters in Business Administration from NOVA Southeastern University in Davie, FL.